After Donald Trump's Muslim Ban was signed on Sunday the tech companies in the US responded. Here's our list of six notable companies that donated or offered free service to those affected by the ban. We aren’t a political news site, so the large list of failings of the current president, Donald Trump typically doesn’t merit our chronicling. That being said, after Trump’s travel ban on the seven Muslim-majority countries hit the news Saturday, major tech companies in Silicon Valley responded the very next day–and that certainly caught our eye. A lot of businesses and figures, like Apple CEO Tim Cook and Facebook founder Mark Zuckerberg, simply sent out tweets and memos giving very lovely and very safe denouncements of the ban, speaking in favor of multiculturalism and its value to the country. But several tech companies actually went out and legitimately took action to match their outrage. Here’s our list of tech companies who went out and did something. Airbnb responded early on Saturday when CEO Brian Chesky took to Twitter. To compensate for people stranded at airports he declared that Airbnb is providing free housing to anyone not allowed in the US. In addition, Chesky has continued to drum up additional housing by asking American citizens to join Airbnb to provide refugee housing. Tony Xu, the founder, and CEO of DoorDash proceeded to tweet about his family’s history and his own as a refugee. After a series of tweets where he decried the ban and celebrated multiculturalism, he revealed that his company would provide free food to any legal service providing support to refugees. 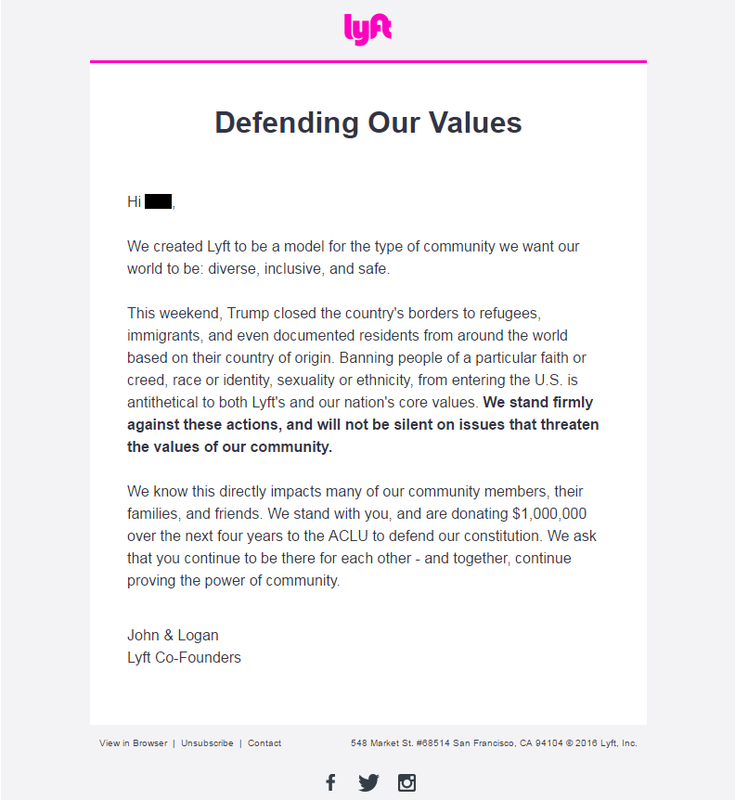 Lyft’s response came in on Sunday when co-founders John Zimmer and Logan Green revealed, through an e-mail to their users, that they would be donating $1 million to the American Civil Liberties Union (ACLU). Viber addressed the problem directly but giving free calls from the United States to the seven banned countries on Monday without fanfare or much explanation beyond their tweet announcing it. Uber went under fire during the JFK protest on Saturday by removing surcharges around the same time as the New York City Taxi Worker’s Alliance boycotted the airport in support. Following the wake of #deleteuber tweets that emerged after, the company vowed to create a $3 million defense fund for drivers who are affected by the ban. Lastly, Google took the stage by recalling employees to the US as quickly as possible. After that, cofounder Sergey Brin was spotted at the San Franciso Airport protesting. Rather than take a soft stance and simply publically object, Google announced that they would be donating $4 million to four select organizations: the ACLU, Immigrant Legal Resource Center (ILRC), International Rescue Committee (IRC) and the UN Refugee Agency (UNHR). The amount donated was accrued from both the company itself and employees therein. As we go forward it’ll be interesting to see how these big tech companies respond to Trump’s drastic changes. The question is, will he lose more and more support from businesses as his plans take effect? Also, if we left out a tech company’s response to the Trump Muslim ban don’t forget to tell us in the comments. I am not for the ban in any way, but these reactions seem to be a little overboard, don’t you think? I”m here because I am a refugee. Well, no kidding. It is nice to see some humanity in these companies, but are they just jumping on board to do just that? I like the response from companies like this. It just shows that there is still a few people out there with heads that are on straight. That is quite the outpouring against something that the new President has put into action. Wasn’t there a ban like this 4 or 8 years ago? I am not sure I remember this many people freaking out then.